Hi everyone! I wanted to pop in real quick and wish all of you a wonderful Easter! 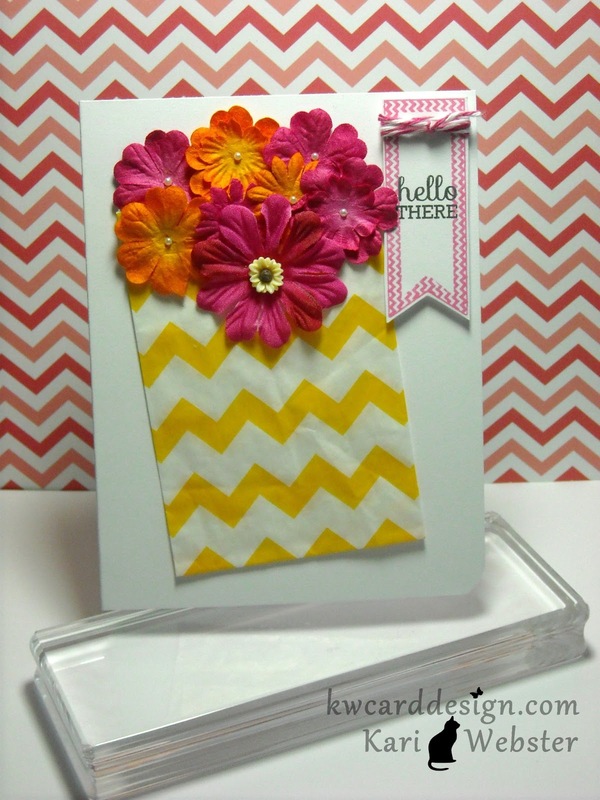 I also would like to share another card reject from the latest Call Submission with Paper Crafts magazine. I think I liked this card the most! I did one of my favorite techniques - the emboss resist! 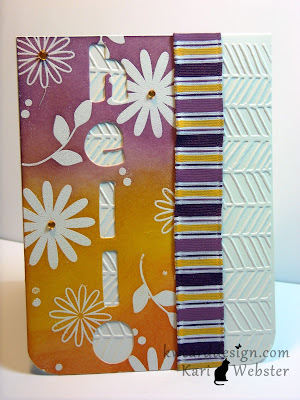 I used the SSS March Card kit stamp set and heat embossed it in white, and then took Wild Honey, Rusty Hinge, and Seedless Preserves Distress Ink and inked up my stamped panel. 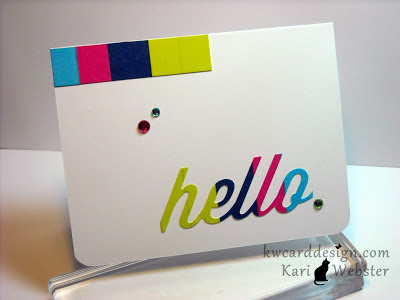 For the "Hello" sentiment, I die cut the letters from these dies from Lawn Fawn. I embossed my card base from a Lifestyle crafts embossing folder, and adhered my stamped panel to my card base - and then added some ribbon I had in my stash that matched perfectly!! Thanks for stopping in today! Have a wonderful Sunday! The weekend is here and I couldn't be more thrilled about it. Even though I have a slight headache this morning, I am just glad that I am lounging here in my favorite chair and sharing some crafty news than at work! First up - for those of you that follow my blog through Google Reader - from what I am reading and "hearing" - it will not exist much longer - so I ask you that if you'd like to continue to follow my blog - to please click on the "Follow my blog with Bloglovin" button on my sidebar and you will be set up to continue to see my posts here on KWCardDesign. I value all of my followers/readers! I hope you will consider adding my blog to your reading roster! Two- I recently submitted some cards into the latest Paper Crafts Magazine Submission. This is my first time submitting -so I was even proud of myself for even trying. My 3 cards didn't get picked up for the fall issue, but that is quite alright. I will continue to try until I see my card and name in print!! What an exciting day that will be!!! So first up is 1 of the 3 that I will share with you. Continue to come back to my blog to see the others as I share them!! This card was part of the color combinations. 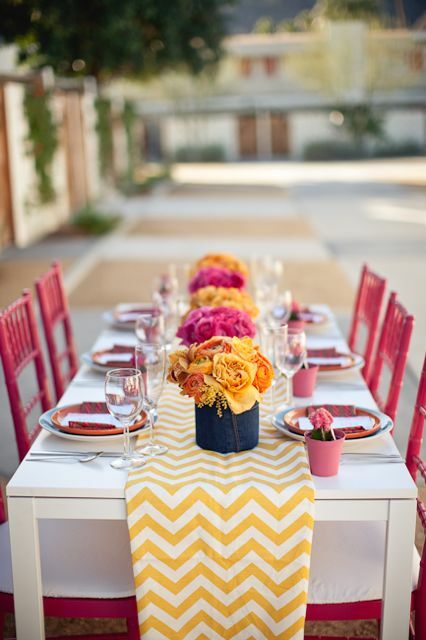 There were 7 or 8 color combinations that you could choose from. I choose the first color combination. Creme, teal, bright purple, rusty, and a golden yellow. This card is a bit different from my style but I wanted to challenge myself. I think it turned out nice - and I will just add it to my stash of cards to give out to friends/family. I'd like to hear your thoughts on the card!! Even some critic if you like to give it!! I really want to be published one day- It is one of the more desired goals to achieve as a paper crafter! 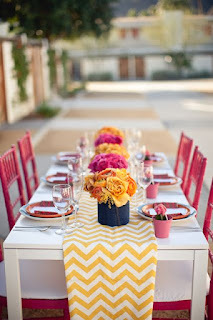 Thanks for stopping in today and I thank you in advance for following me through Bloglovin!! Hello all! I am back to share with you my submission for the latest Lawnscaping Challenge. It is all about stitching whether is faux, by hand or by a sewing machine. Personally, I am not sewer, but I have done a little in the past. I don't do it on my cards hardly ever - but its a fun change to add something new to my card designs. For my card, I used Lawn Fawn's set - "Happy Easter". What a cute set this is! 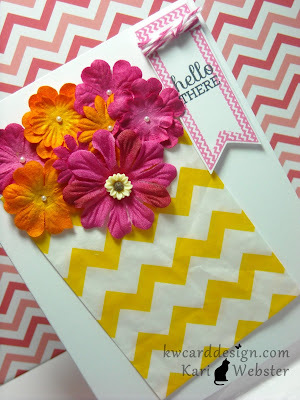 AND - you can use it so much more than for Easter cards. I started out my stamping in Versa mark ink my "hopping lines". I needed a guide to paper pierce my holes for my hand stitching. Then, I went to town with my hand stitching. It was fun to have this fun element on my card. 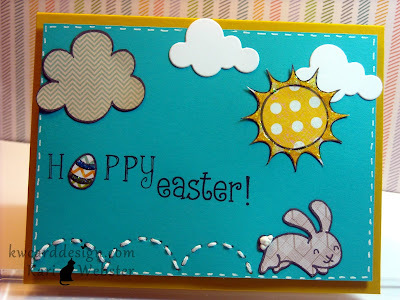 Then, I stamped and paper pieced using various pattern papers for my bunny, one of my clouds and my sun and one of the Easter eggs for some fun patterns on my card. I had die cut some clouds previous that I didn't use and decided to add them to this card. I changed the "Happy Easter" sentiment slightly by using Sally's ABC's and inserting one of the Easter eggs for a fun element to the sentiment. I like mixing up different fonts in the sentiments too. I added some yellow Stickles to the sun, and Star Dust Stickles to the egg - and for the bunny's tail - I added some white Liquid Applique for a "puffy" tail. 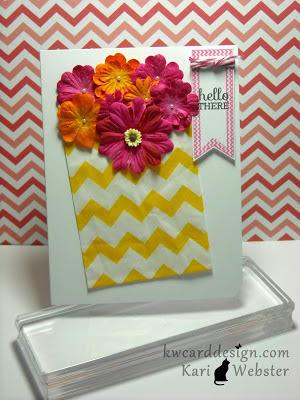 I used one of SSS's new Spring Releases called Circle Friends along with the coordinating die. 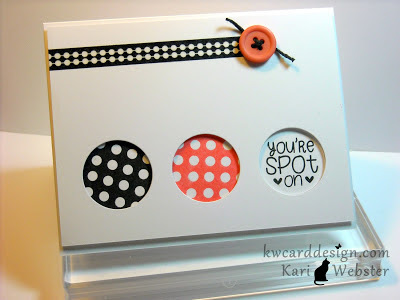 I used some PTI white card stock - and inked up my polka dot stamp first in Versa Fine Onyx Black ink and stamped that on my card base, then inked it up in Hero Arts Pale Tomato, and stamped that also on my card base and then added my sentiment in Versa Fine Onyx Black Ink. Then I took my die and die cut my white card panel, and added some foam adhesive to pop it up on my card base. I added some washi tape and a button to bring everything together. This set is so fun to play with, and the die makes it easy to pull it all together. Thanks for stopping by today!! See you right back here soon! SUCH a long time since I have played along with the CAS-ual Friday Challenge. 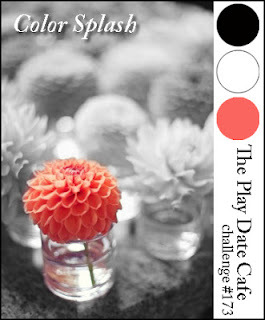 This challenge looked interesting to me since I LOVE color - its all about creating a clean and simple card featuring a color block. This gave me a fun chance to play with my new PTI "HELLO" die from their latest release. I thought it would be fun to use some of my EVER growing washi collection too! I picked out some solid washi tape colors which coincidentally is also the colors for the PlayDate Cafe Challenge for this week - so I am also entering this card into that challenge also. So - I put down my washi tape on a piece of white card stock that I had in my scrap pile, and die cut my "hello" sentiment. I adhered it to my white cardbase, and added some gems that went well with my washi tape colors. I had a section of the color blocked washi left and I thought it would be fun to adhere it to the top left of my card to round out everything. Hope everyone has a nice rest of the weekend!! See you back here on the blog soon! Hello!! 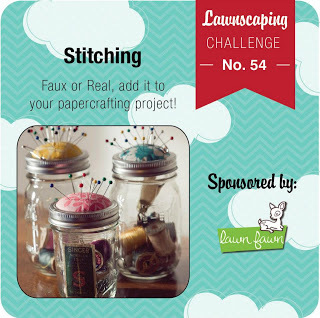 Kari here back to share my latest entry for the Lawnscaping Challenge. I know my posts are sporadic, but really the only time I get to get crafty is during the weekends. I look forward to the times I do get to play and get creative!! I think about it ALL the time! So, I couldn't wait to get to the next LSC Challenge. It is all about texture this time - and it was a good time to get to play with some new crafty goodies I have recently received. Specifically, a new ( to me anyway) rainbow die from "My Favorite Things". 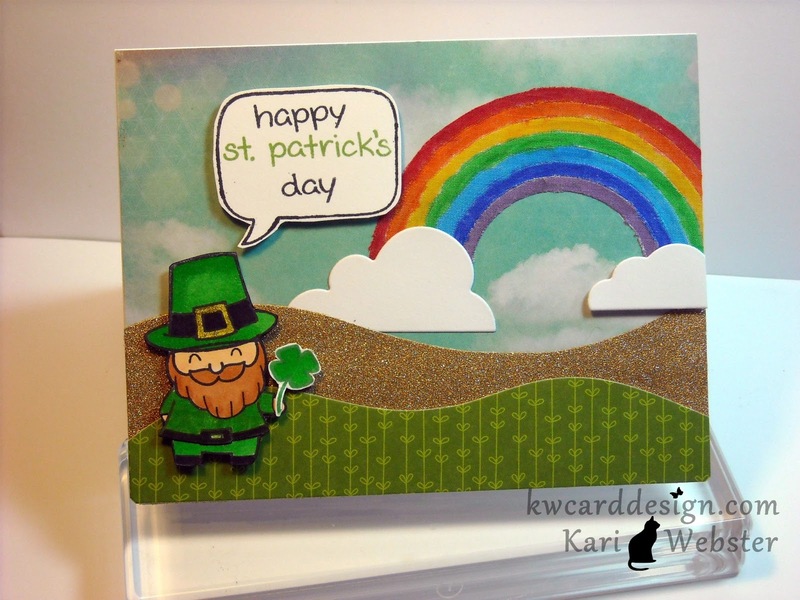 Knowing that St. Paddy's Day is coming up very soon - I thought it would be fun to create a fun little scene for this holiday. I usually don't make any cards for St. Patrick's Day - but I wanted to play with the new die I mentioned, and see what I could do with it. I struggled for a little bit on it, simply because even though I have little fingers, when I have to works with small details, I am "clumsy" and spend more time messing with it. So - instead of using the card stock I had originally cut out, I remembered that I bought a new 6x6 DCWV stack with Adhesive Fabric. So I cut out the rainbow ( and it would stay together a bit better, because it has a paper backing on it) and picked out some Copic Markers, and very carefully colored my rainbow. Since this is fabric, the ink transfers fast, and "bleeds" so I had to be careful with it. 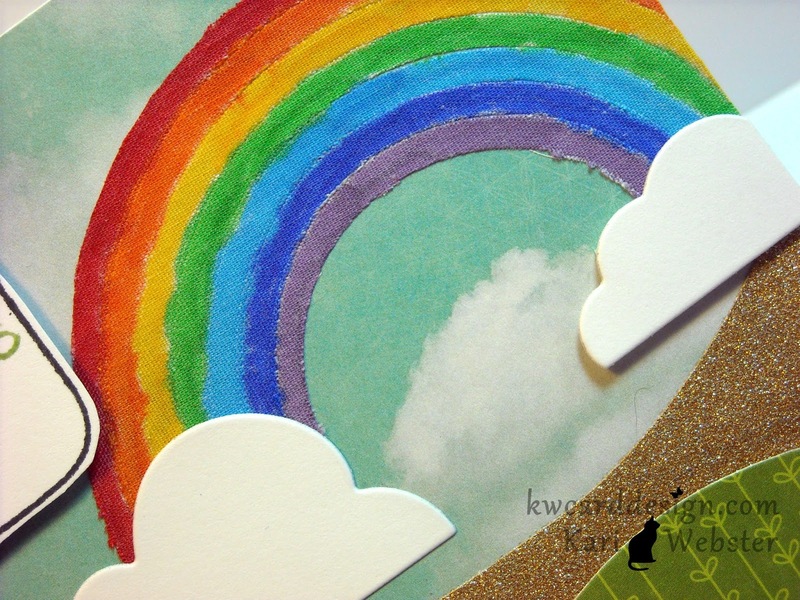 Once the fabric rainbow was colored, I die cut two clouds also from MFT. I then grabbed some of my gold glitter paper from American Crafts and used my "On the meadow" dies from PTI, and die cut a piece of gold, and some paper from the "The Bright Side" Lawn Fawn Collection. The cloud pattern paper comes from a new 6x6 pad from Crate Paper/Maggie Holmes collection. LOVE this paper!! So realistic and pretty! I, then stamped out my "Leprechaun" which is the gnome from "Gnome Sweet Gnome" and added a "Leprechaun" hat from "Hats Off to You". I did some quick Copic coloring and paper-pieced his shirt. For my sentiment - I used "A Birdie Told Me", and the "Happy St. Patrick's Day" sentiment from "Hat's Off to You". I then started assembling my card and really like how it turned out. It has texture from the gold glitter paper, and from the fabric of the rainbow. Here is a closer look at the rainbow's texture. Thanks for stopping by!! See you all soon! !